To be perfectly honest, I thought macarons were overrated until I tasted a bacon and maple cream cheese beauty from Macaron Parlour at the Brooklyn Flea. Since then, I've had a special place in my belly for these crisp and chewy gems, so when I heard about a macarons demo featuring Almondine owner Herve Poussot, I couldn't pass it up. 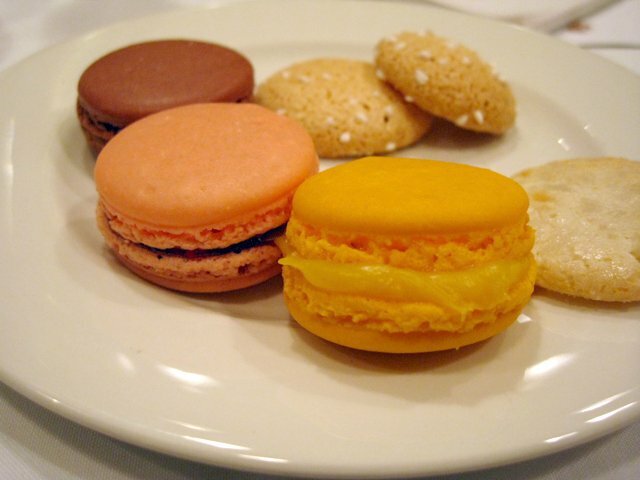 The Bakers Dozen East presentation at the Institute of Culinary Education covered three types of treats: macaroons, amaretti and macarons. The first two start with the same recipe: almond paste, egg whites, sugar. The end results -- the macaroon is chewier than the crisp amaretti -- are achieved with less egg in the former and refrigerating the latter. Oh, and the amaretti is tricked out with crunchy pearl sugar. Throughout the night our host, Nick Malgieri, director of baking programs at ICE, would drop entertaining tidbits of information as he showed us how to make the chewy macaroon and the crisp Italian amaretti. We got the scoop on what almond paste to avoid (stay away from cans) and the difference between pearl sugar in Europe and the U.S. ("In Europe it looks like sugar crystals, but what we get looks like bits of plaster!") But I knew I was among my people when he confessed, "I wish I had [a Hobart mixer] in my bedroom!" Then Poussot took over the cooking counter to show us the classic French macaron. Instead of almond paste and sugar, you start by mixing almond flour with confectioner's sugar. The consistency is almost like grated Parmesan cheese (below left). Then you make an Italian meringue with sugar syrup and egg whites and fold that into the almond mixture (below right). Useful tip: Break out the egg whites 2-3 days before making the macarons and let them chill out in the fridge. As Poussot piped the mix out, bottles of champagne were uncorked and when they slid into the oven, cookie plates for each person appeared. I wish I could have made those divine bites last longer! So will I make these at home? I sure want to try, and that would mean I'd "need" to finally get a stand mixer. Do you have one? Tell me all about it in the comments. See more photos from the Macarons Demo by Bakers Dozen East.